The PCE-DSA 50 sound level meter is a class I device with an analyser for measuring 1:1 and 1:3 octaves in real time. 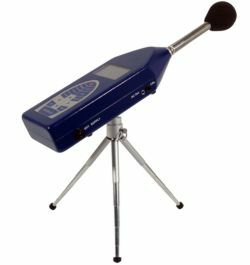 The is an irreplaceable tool for any professional needing to measure sound due to the wide range of properties the device holds. This sound level meter has a light-weight, ergonomical and durable metal enclosure that fits comfortably in the user's hand. It is also very easy to use. Our professional class I sound level meter is ideal for use in the industrial sector, health and safety and for environmental control of noise pollution. This device allows for measurements to be taken over long periods of time and for data to be transferred to a computer for further analysis. The sound level meter has internal memory. Data is transferred to a computer via a USB cable. More class I sound level meters that meet all the standards set by Physikalisch-Technischen Bundesanstalt (PTB). Operating condictions -10 to 50°C , below 90% r.h.
Making a professional acoustic analysis of traffic. Noise pollution is primarily produced by the wheels upon the road surface. There is also a lot of noise produced by engines, the environment within the vehicle, the number of vehicles and their respective energy. Here you can see the PCE-DSA 50 sound level meter mounted on a tripod taking a prolonged measurement of noise. The display of the PCE-DSA 50 sound level meter is visible here, showing the equivalent continuous noise level (Leq). The equivalent continuous noise level is used to describe different sources of noise pollution. When large fluctuations n noise, such as traffic, it selects an average noise level or equivalent continuous noise level of acoustic pressure such as the average time to evaluate the noise being measured. 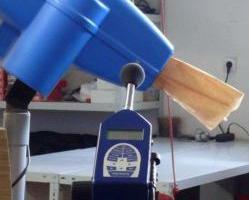 The PCD-DSA 50 sound level meter testing noise in the workplace. Noise is one of the most common risks to health within the workplace. The noise level meter is used for taking a measurement, either at a specific moment in time or over a long duration. This sound level meter is excellent for ensuring workers are not put at risk due to high levels of noise pollution at work. 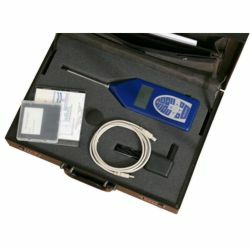 The device serves as the basis upon which preventative measurements are taken, such as determining the best type of protective equipment for a given job. 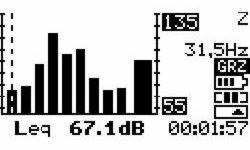 Here is an image of the software for the PCE-DSA 50 sound level meter measuring frequency. 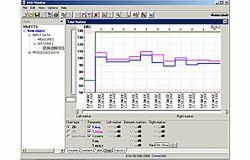 This software allows for data to be transferred from the device to a computer via a USB cable. The programme is in English and will display data in graph form or in spreadsheet format. 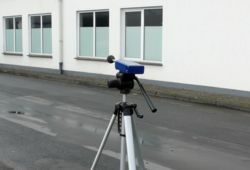 It also allows the noise level meter to be adjusted and to simultaneously produce readings both on the device's display and the computer screen. Here is the PCE-DSA sound level meter in its carrying case. Here is the PCE-DSA 50 sound level meter mounted on a tripod. 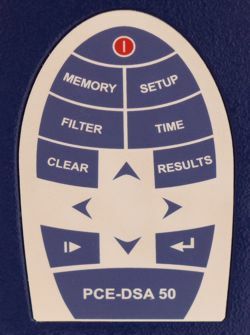 Here is the keypad of the PCE-DSA 50 sound level meter. 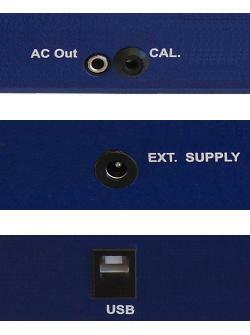 Here are the different connections of the PCE-DSA 50 sound level meter. Light-weight aluminium tripod. It's useful for making a series of measurements and guarantees that readings can be reproduced more accurately by keeping the microphone fixed in place. Furthermore, the user can be free to manually record readings or to perform other tasks. For companies that wish to include the device in thier group of internal tools or for annual recalibrations (in cases when the calibrator is not used). The ISO calibration includes a laboratory calibration and a document with all the measurement values.